So how do you avoid creating those telltale swirl marks — “fish eyes” — when disc sanding with a pneumatic random orbital sander? Swirl marks are usually a result of insufficient supply of air pressure into the sander causing the sander to slow down. The sporadic appearance of swirl marks is usually the result of having an underpowered compressor that can’t handle all shop equipment. In other words, the compressor may produce enough of the recommended air pressure —90 PSI — when only the orbital sander is being used. However, when a second piece of equipment is turned on, that uses air and is running while the orbital is being used. So turning on the second machine may cause the air pressure to the sander to drop beyond this critical level, thus causing the swirl marks. In this particular case, the compressor does not have the sufficient capacity to handle all the shop equipment. Besides operating at no less than 90 PSI of air pressure, random orbital sanders should run with a minimum speed of 10,000 RPM. If you run the sander at a slower speed than this, swirl marks MAY also appear. 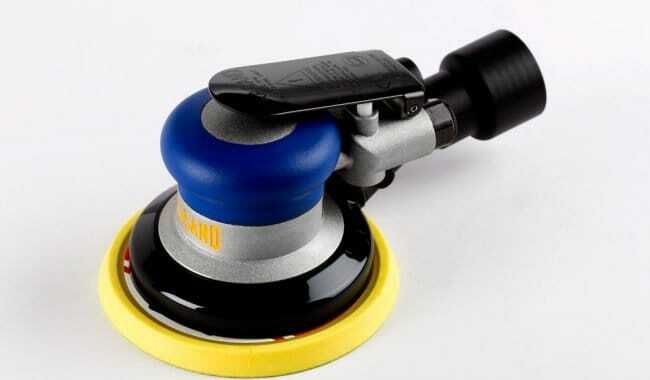 But if you drop below 90 PSI at any time during your orbital sanding process, you WILL get swirl marks. Again, in many cases like the example above, when insufficient air supply occurs sporadically, the swirl marks can appear. Although insufficient air supply is the number one cause of swirl marks, there are numerous other reasons that can contribute to swirl marks as well. Certainly starting the sander before contacting the surface and/or stopping the orbital sander on the surface is a big one for avoiding swirl marks. Just remember this rule — START ON…. STOP OFF. Dull grains can also cause swirl marks, resulting from using incorrect sanding abrasives, as well as improper sanding techniques, such as applying too much pressure or moving the sander too fast across the surface. In addition, technical issues with the orbital sanding machine should be taken into account over time, such as worn bearings, lack of sander lubrication (2 drops of light machine oil for every 8 hours ran — no less), too much sander lubrication (2 drops of light machine oil for every 8 hours ran — no more), and if the sander is dropped or the pad gets bent. Shop conditions also play a part in contributing to potential swirl marks. Insufficient dust collection is one, since grinding the dust into the wood can leave swirl marks. If possible, see that all sanding takes place on a down draft table. A related issue is water in the air supply, caused by a combination of faulty or loose seals in pipe and hose connections, along with shop humidity. Leaks both allow water in and allow air to escape — both bad outcomes. Water in the system reduces the efficiency of the air supply to the sander, potentially lowering the pressure past the 90 PSI threshold. Excessive moisture in the wood is another environmental concern that could be a supplier issue or shop storage related. Either way, if this problem is detected, further steps such as drying the wood should be taken. Common sense plays a role in avoiding swirl marks, too. For example, using the wrong type of backing pad, dirty or damaged backing pads and employing wrinkled or torn paper, as well as having an incorrect sander orbit, need to be avoided at all costs. If you make sure to follow all of these guidelines, and/or train your people to follow them, then “fish eyes” won’t come back to haunt you or your customers.